making: ROBYN'S FETISH CHALLENGE # 342 "ANYTHING FOR THANKSGIVING"
ROBYN'S FETISH CHALLENGE # 342 "ANYTHING FOR THANKSGIVING"
Good Morning!! Hope you had a great week. My Saturday was wonderful. My son had a Birthday Party for my Grandson. My son moved out in the country and the fall leaves on the trees were beautiful. Was a very nice ride. On the ride home we seen the most amazing sunset that we watched all the way home. Nice party and a very peaceful day. Our wonderful sponsor for this week is our own Robyn from Robyn's Fetish Digital Stamps and More. We were able to go to the Thanksgiving section in her store and pick out one image to use for this week's challenge. Since we could make anything for Thanksgiving I chose "The Scarecrow And His Friend." I knew I had pictures of my kids when they were little and walked in a parade around the school halls. They were dressed as little Indians. I knew I wanted to make another Scrapbook Layout. So, I want to tell you what Robyn is giving to this week's winner and then show you my layout. Now here is my layout that I decided to call "Thanksgiving Parade." I showed the kids the pictures and they didn't remember the parade or even making their Indian costumes. They are so adorable. So, I used the picture of my sons and then added the scarecrow that I had colored. Used two different papers to put behind the pictures. 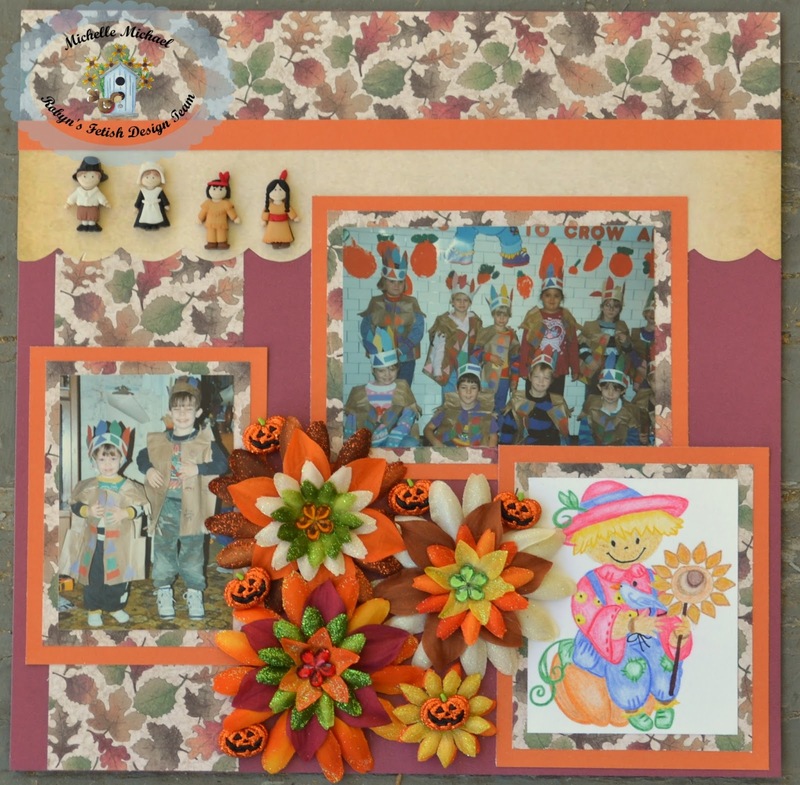 Added the glittered flowers, glittered pumpkins, Indians, and Pilgrims as embellishments for the rest of the page. 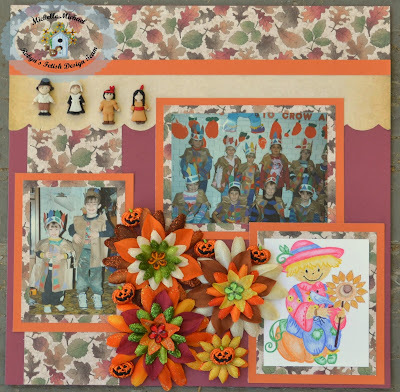 I had ordered a 3D Thanksgiving sign for the page but I never received it in the mail in time to post my project for the challenge. I probably will added it when I get it. These are the items that I used to make this layout. I hope you enjoyed the layout. I did have a lot of fun making it. I always do when it's made with an image and pictures of my family. I would love to see you projects that are about Thanksgiving. So if you go to The Robyn's Fetish Challenge Blog add your project and you will also see the other projects that our Design Team made for their Thanksgiving project. So have fun making what you decide to do and I will be back here next week with another new challenge. Have a Wonderful Week! !